White trillium, great white trillium, white wake-robin. Renowned for its beauty as one of the most striking of all spring wildflowers, large-flowered trillium leaves an indelible impression on all who are fortunate to encounter this plant in its native environment. The great beauty of the plant’s flowers, singly and in groups, and its preference for rich soils in undisturbed forests and coves in the mountains of Virginia make it deserving of recognition as the Wildflower of the Year, 1996. The genus Trillium is a member of the Lily Family, the Liliaceae, which possesses about 335 genera and 4800 or more species. The Lily Family includes many species of agricultural importance, including onions and asparagus, and ornamental plants, including tulips, lilies, hyacinths, and hostas. The name wake-robin is commonly applied to several members of the genus Trillium, a group of 30 species found in the Himalayas, east Asia, and North America. The North American species are mostly in the east. 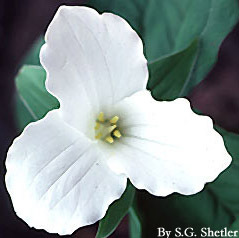 The pattern of Trillium species with primary representation in eastern Asia and eastern North America is observed in many genera; others exhibiting this pattern include hepatica, twinleaf, and skunk-cabbage. Large-flowered trillium most commonly grows in wooded sites with rich moist soils in relatively undisturbed woods and coves. The plants grow in slightly basic or circumneutral soils, but some authors suggest that the plants do well in slightly acid soils as well. Trillium grandiflorum grows in the range of shade conditions typical of mixed-species forests. Individuals of this perennial plant range in height from 6 to 20 inches. A single, unbranched stem originates from a short, stocky rhizome. The stems are green, but occasionally plants with purple stems are found. A whorl of three dark green leaves is found on the stem. The wavy-edged leaves can be 3 – 6 inches in length and are ovate to rhombic as well as lance-like in shape, and the tips are sharp pointed. The leaves are attached directly to the stem or possess a short petiole. The leaves are net-veined, an unusual trait for plants in the Lily Family with most species having parallel veins. The foliage persists to late summer. The beautiful, pure white flower is borne singly on an upright or gently arched three-inch pedicel above the whorl of leaves. The flowers appear in mid-April to mid-May and measure 2 – 4 inches across. The flowers produce six yellow anthers and a three-chambered ovary capped by a three-lobed stigma. The three waxy white petals alternate with three green sepals to form a flower that is funnel-shaped at the base and open at its apex. The petals generally turn pink with age, but in some populations pink flowers are produced directly from the bud stage. In the large drifts and stands that large-flowered trillium forms, one finds a magnificent mosaic of color. Bees and butterflies reportedly visit the flowers with some regularity. Maroon-flowered relatives of large-flowered trillium are ill-scented and attract carrion flies as pollinators. Being the most variable of the trilliums, it is not unusual to find a variety of petal color and floral forms in large-flowered trillium. A three-angled, white or cream-colored berry forms, and several seeds ripen about eight weeks after flowering. The seeds bear an oil body called an elaiosome that functions as an attractant to ants that disperse the seeds and harvest this body as their food reward. Many spring ephemerals attract seed-dispersing ants through the production of an elaiosome. Large-flowered trillium has long been considered a valuable component of woodland gardens. Planted in a soil rich in leaf mold in a shaded site, this plant can be long-lived. Uneven soil moisture, drought, and inadequate preparation of soils are detrimental to garden plants. Large-flowered trillium is most attractively planted in drifts along with native ferns, bloodroot, jack-in-the pulpit, Dutchman’s-breeches, foamflower, hepaticas, wild gingers, and wild geraniums, among others. The depletion of natural Trillium populations through commercial collection of rhizomes is cause for concern among botanists and horticulturists. Gardeners are cautioned to never purchase these wild-collected plants and to be aware that phrases such as nursery-grown or field-grown may describe plants that have been collected from the wild and held for later sale. Furthermore, plants started from collected rhizomes often have a low survival rate. Gardeners are encouraged to obtain plants propagated by growers from seed or to start plants from seed themselves. Propagation from seed requires patience but is worth the effort when plants first flower. Seeds must be sown immediately upon collection in late June or early July in sandy leaf mold that is kept uniformly moist through the first year. The seeds germinate the following year, and the plants will flower in as few as three years but more typically in four or five. Once the plants are established, gardeners can induce them to produce offsets by excavating soil from around the rhizomes, nicking the rhizomes to induce bulblet formation, dusting the wound with fungicide, and refilling the planting hole. Scarring should be done after the plants flower. At the same time a year later, the gardener can remove soil from around the previously scarred rhizome and sever newly formed bulblets. Bulblets flower in one or two years. Gardeners should leave the foliage to mature to provision the rhizome with energy to promote flowering the next year. The removal of flowers can also reduce the reproductive success of the plants. Traditional uses for the leaves of Trillium grandiflorum include adding the fresh leaves to salads or boiling them as a potherb. This practice is now discouraged, since it can lead to mortality of the rhizomes. Native Americans reportedly gathered and chewed on the roots for a variety of medicinal purposes. Trillium grandiflorum grows from Quebec to northern Minnesota and south to eastern Georgia and Arkansas. Large-flowered trillium grows commonly in rich woods and coves in most counties in the Ridge and Valley province of Virginia (see Atlas of the Virginia Flora, 1992). It is the chapter wildflower for the Blue Ridge Chapter of the Virginia Native Plant Society. Perhaps the largest T. grandiflorum population in North America is found at the G. Richard Thompson Wildlife Management Area near Linden, Virginia. Gardeners should be sure that trillium and other native plants purchased for home gardens are nursery-propagated plants, not wild-collected.